The replacement of all the windows in Wells Hall is completed. They look great, and will dramatically improve our energy efficiency. The same is in process for Robertson Hall, and will be completed in time for school to start. Will be great to have new windows in both of these residence halls for men. Typing “online degree” into Google gets you over 58 million results. But, we believe there is a BEST choice…..and the growth of our online enrollment is proving that we are meeting the needs of online undergraduate and graduate students. 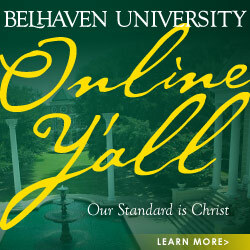 You can learn all Belhaven online degrees HERE. A few weeks ago National Public Radio did an encouraging story on the value of higher education. They point out that during every recession, there are a host of new stories asking questions about college cost vs. value. Before you believe those stories, you need to listen to this NPR piece. You can read it or listen to it HERE. College graduates were less likely to be unemployed before the current recession started and less likely to lose their jobs after the recession happened. “And in fact, … college graduates … are the only segment of the economy where employment has actually gotten better during the first five months of this year,” he says. We always see a spike in doom stories during economic downturns, and he says people love to hear them. Anthony Carnevale, labor economists at Georgetown University, has calculated that on our current pace, the U.S. is going to produce 3 million fewer college graduates by 2018 than the economy will demand. 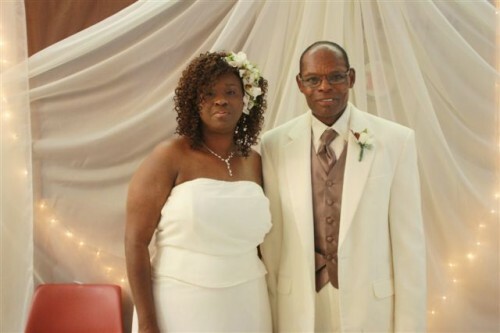 To Mr. and Mrs. Lenard Schaffer. Lenard has worked on our grounds team for many years and keeps this campus looking like a park. He looks pretty good in this picture from his wedding this past Saturday. We take for granted our freedom, but as we are getting ready for the start of a new academic year, this story out of North Korea is a good reminder that we should be thankful for what we assume as common to all. Here are excerpts of the story about what is happening with college students there – this is remarkable! Close watchers of North Korean affairs were caught on the hop last week by reports that universities in the hermit kingdom would be closed from 27 June for up to 10 months while students are sent to work on farms, in factories and in construction. The Pyongyang government had ordered universities to cancel classes until April next year, exempting only students graduating in the next few months and foreign students. The reports said the students would be put to work on construction projects in major cities and on other works in a bid to rebuild the economy. This could indicate that the country’s food crisis and economic problems are worse than previously thought. Experts on North Korea said full-scale university closures would be unprecedented. However, it was not unusual for students to be engaged in manual labour, with the academic year sometimes shortened in order to send students onto farms and construction sites. Charles Armstrong, Director of the Centre for Korea Research at Columbia University who returned from Pyongyang earlier last week, said he had visited two state-run universities, Kim Il Sung University and Kim Chaek University of Technology in Pyongyang, as well as the private Pyongyang University of Science and Technology (PUST) in the last few weeks. “My impression is that there is not a lot going on in terms of teaching and studying in public universities and student time is taken up with ‘extra curricular’ activities including political education. This is a regular part of university life but I have not heard of the universities being shut down completely except for a short while during the 1990s [famine],” he added. Analysts in Japan and South Korea suggested there could be other reasons behind the decision to disperse the students across the country, including the possibility of demonstrations at campuses inspired by the Arab Spring uprisings, which began at universities. They noted that North Korea had purchased anti-riot equipment from China in recent months, including tear gas and batons, while there has been an increased police presence at key points in Pyongyang in recent weeks. According to North Korea analysts, party controls are in place to prevent student uprisings, including political indoctrination and strong surveillance. Some analysts said surveillance on campuses had relaxed in recent years because many party officials had not been paid. However, experts agreed that the possibility of universities being shut would be an ominous sign of tension. “The most likely reason [to shut universities down completely] would be for military mobilisation if they thought they were going to be attacked,” Smith said. You can read the full story from University World News HERE.